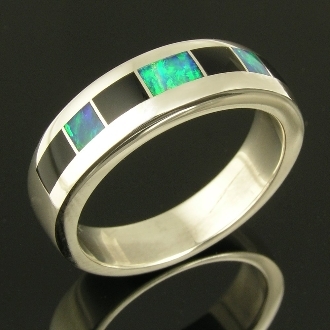 Sterling silver ring band with Australian opal and black onyx inlay by Mark Hileman. Four pieces of black onyx boldly frame the Australian opal inlay. The opal inlay is a blue body color with bright flashes of blue and green. This handmade sterling silver man's ring is 6mm wide and is shown for scale in a size 10. This ring is available by special order only in most ring sizes as well as other inlay materials. Customization options. Special orders usually can be completed in 4 to 6 weeks depending on our work load. This ring would make a nice wedding band or man's engagement ring for someone not interested in the traditional gold band. A matching woman's band can be special ordered to make a set if needed.